Fiberglass Hawaii has been supplying the needs of composite builders since 1966, shipping products worldwide. We stock an extensive inventory of polyester, epoxy, and vinyl ester resins. Our reinforcement stocks include carbon, glass, and kevlar fabrics, as well as a wide variety of specialty fabrics, mats, and roving. When it comes to building with reinforced plastics, we supply the tools, chemicals, abrasives, colorants, and support to satisfy the most eclectic needs. FGH Product List available for download. Stand-up Paddleboard Blanks In Stock! In addition to the to the US Blanks SUP line that we carry, we have high quality block polystyrene and polyurethane stand-up blanks available exclusively through our Ventura store. Call (805) 644-0009 for more information. As the popularity of paddleboarding continues to grow, we will strive to bring you the products you need to build the highest quality boards. For surfboard shapers, we stock large quantities of US Blanks's high-quality polyurethane and EPS surfboard blanks at the best possible prices. For the most up to date information and pricing, please check our webstore HERE. Effective 3/1/15 the Ventura store is only open once a month on the second Saturday. Extended hours 9AM-3PM. 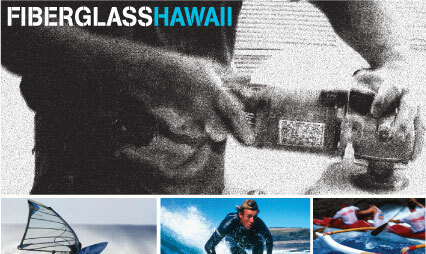 Shop Fiberglass Hawaii Online 24/7! Check out the online shop. You can find all of our social media info, blog and products now in one place! We're active in the Blogosphere! Follow Fiberglass Hawaii's Composite Corner for weekly updates. Have a Facebook account? Become a fan of our page! Follow us for updates, events, new product announcements. Download the Instagram App to view FGH pictures and product images. We are currently building out the content of our website, so please pardon the mess of construction. If you have any questions or suggestions, contact us by phone at (808) 847-3951 or by email.